Materials exceeding the TRU Fair Dealing Policy may be cleared under the Access Copyright License up to 20% of a text or journal provided the material is not on the exclusions list of publishers who do not want their royalties collected by Access Copyright. Materials between 20 and 25% of a text may be cleared by means of obtaining special permission and recording this on the Access Copyright Transactional spreadsheet. Permission can also be obtained to copy an entire text where it is out of print and there are no newer editions available. These also are recorded on the Transactional spreadsheet. When a course pack has been received from the Printshop for a campus based course, the person assigned to it goes through it for third party materials and assesses whether they can be deemed fair dealing , require a permission or whether they need to be logged on the Access Elog. If there are no materials being elogged, the Printshop is notified that the course pack has been cleared and a copy of that notification is sent to the Bookstore so that they know the course pack is coming. If there are materials which are logged on the Elog, then a separate email should be sent to the Bookstore advising them of the number of pages that are being copied under the Access License. If the amount exceeds 20% of the text and an Access Transactional License is also required, the amount charged for the Transactional License must also be reported to the Bookstore. 1)	In order to clear materials under the Access Copyright license, you require the ISBN (books)or ISSN number (journals) and the publisher’s name. These are entered into the Access Copyright Repertoire Look up Tool https://rms.accesscopyright.ca/rplookup/repertoire/RepertoireLookup.aspx which will provide you with information as to whether it is permissible to use the Access Copyright License to duplicate the requested materials. 2)	If the material is available in the Access Repertoire, the information for the third party material you are clearing is entered into the appropriate Elog Master form (located on the O drive): Campus or OL. 1)	Use the Access copyright look up tool to make sure the material is available for duplication. 2)	Use the request form https://rms.accesscopyright.ca/rplookup/repertoire/prequest.aspx to request permission for a transactional license. Separate transactional licenses are generated for Campus and OL. For OL requests, in the box for Licensee add the letters "OL" behind Thompson Rivers University so that Access Copyright is clear that the request will go on the OL transactional license. Comments box might indicate that the entire text is required as it is out of print or "This request is for 21% of the text and requires a transactional license". 3)	Access copyright will acknowledge the request immediately by automated email. It may take 2-5 business days for them to provide a return email which authorizes the use. The permission must then be entered on both the Access Elog for that portion under 20% and on the Transactional License log for that portion over 20%. When entering materials on the elog, it is important to include both the course code and the instructor name for campus courses as there may be several sections of the course offered each with their own unique course pack. All columns are filled except for the Number of sets made. b)	In the case of Campus, this will be filled in later when we go to submit the elog. A sales report is obtained from the Bookstore which provides the number of copies for each course and section. Where a transactional license permission is required, the first 20% of the material is placed on the E-log. a)	It requires the intellectual property officer to fill in the date the permission was requested, the date the permission was granted Access Copyright, and the requesting officer’s name. b)	The course code is entered, without the professor’s name. c)	Use of the material, print or digital, needs to be specified. d)	The total pages in the text must be specified. e)	The Specific Page Range requested includes all of the pages requested. f)	The 20% portion is calculated automatically for you as are the additional pages available under the Transactional license. The transactional license spreadsheet will also calculate the number of pages which exceed the license limit ( exceeds 25%) – which cannot be duplicated under Access Copyright permission. h)	Fill in the number of permissions requested. i)	OL Print materials procedure: before submitting the Transactional License to Access, the number of copies "sold" to students during the period should be verified with the OL Materials coordinator (OLbookbuyer@tru.ca), and the number of permissions requested should be amended accordingly. A copy of the spreadsheet showing materials used should be saved in the O:drive in the Access Copyright folder. ii)	For OL materials that are in digital format, the requested number should be verified based on enrolments, again before submitting to Access. Enrolment information is found course by course in Tableau. iii)	For Campus (Face to Face) course pack material, the requested number should be verified based on course packs sold for the course in question during the period. This information will be provided by the Bookstore upon request, and a copy of the spreadsheet should be saved in the O:drive in the Access Copyright folder. 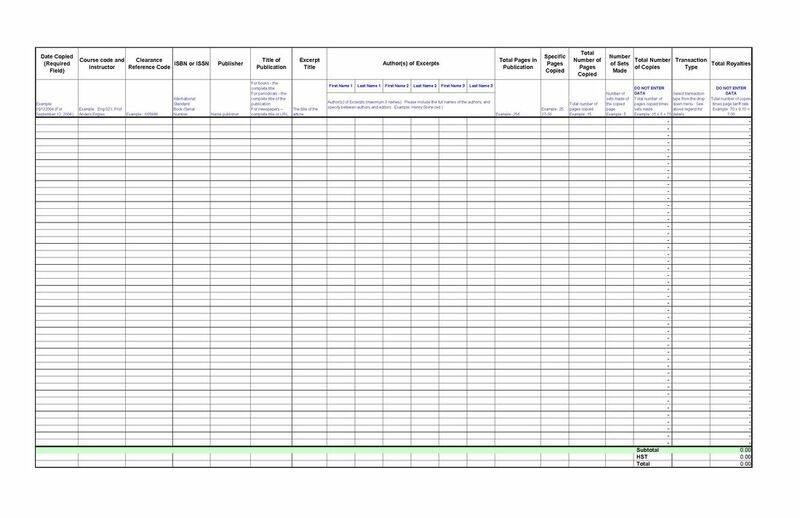 Access Copyright sends out the Transaction Spreadsheet based on the requests we have made during the period and asks us to confirm our usage. Once we have checked the Transactional License against our copy to confirm the materials used and have confirmed the number of users, we email a confirmation back to Access Copyright who then issue an invoice for the materials used. This invoice is paid by the Intellectual Property Supervisor. The Intellectual Property Supervisor reviews all elogs and Transactional License Reporting before they are sent to Access Copyright. This page was last edited on 30 October 2014, at 15:37.